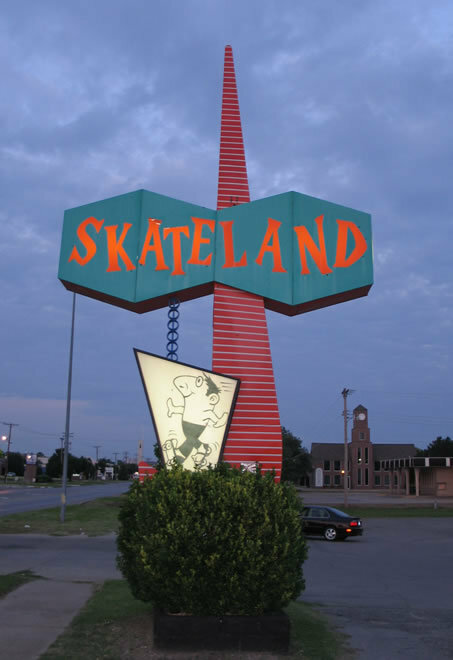 Skateland of Norman, Oklahoma was not only a place that I fell in love, but I also fell in love with skating. While I understand that not everyone in the world grew up middle class in the suburbs of the Mid-West, I hope that everyone can appreciate that memory of the first time you actually discovered what a crush was. Ever since 5th grade, roller skating has had a romantic slant to it. Maybe it was because of the I felt like I was gliding on the floor and my oneness with the flow of life, or maybe it was because our school parties there, thus the opportunity to be near a girl outside of the classroom. We were but 10 years old, but the lights would turn low for the “couples skate” (which I never skated in) and also for “The Snowball,” in which all the boys would line up under the rainbow at the far end of the rink and the girls would line up along the carpeted wall near the entrance. With the disco light spinning, one couple would skate together until the first whistle blew. After that, the couple had to split and find a new partner. Sure there many times that I was left standing on the wall, but on a couple occasions I was picked. I remember being 3rd (maybe it was 6th) on Kristen Costello’s list of boys she “liked,” and hoping that she would pick me in the Snowball. When she finally did (after skating with at least 2 others before me) I felt like the luckiest guy in the world. I might have even held her hand. Spending Friday nights at an old roller rink these days to watch Roller Derby sure brings back some nostalgic feelings. The concession stand you can skate right up to. The wet bathroom floor that you don’t worry about because you are in rented skates. The video games that you never have enough quarters for. But most of all the fact that you are in a place with a bunch of other people that would rather no place else in the world. Here’s to skating, here’s to derby and here’s to a lot of new memories created with each day we live our lives.